Yilaime Corporation. We export a broad range of goods and services tailored to customers needs. From software and computer equipment to accounting and management systems control and support; from artifacts and fine wine, to produce such as nuts, to developing marketing programs, and securing licensing technology to help companies grow, we offer a complete exporting solution to help companies meet supply chain and funding challenges. 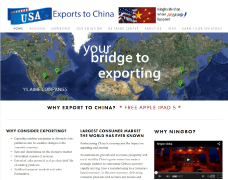 "a bridge to exporting, funding, and technology" focusing on the USA, China, and Africa." "a complete exporting solution to help companies meet supply chain and funding challenges"